Instead of some kind of punishing excercise, Spook suggested a wee Sunday stroll. 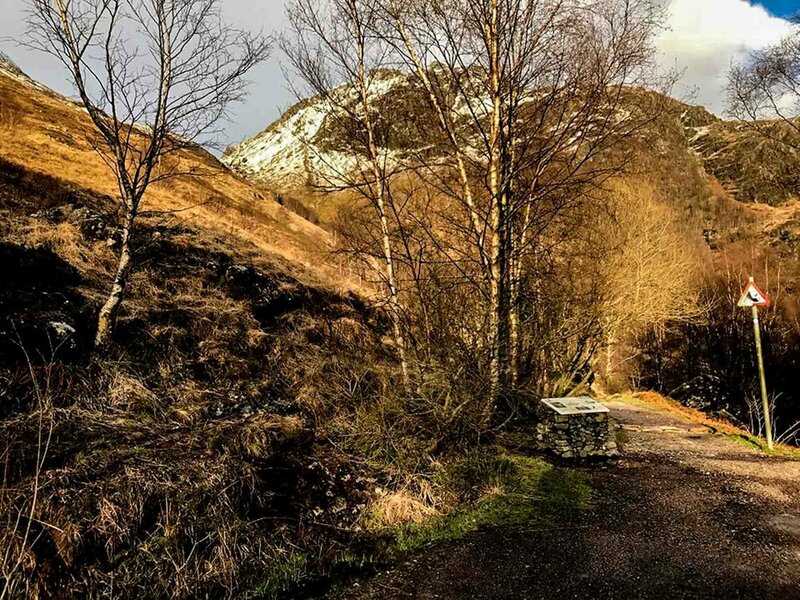 He suggested going to the head of Glen Nevis and taking the alternative route to Old Steall. I checked first that this didn’t entail clinging to the lower slopes around the back of Ben Nevis and his closed eyes and slow expiration of breath suggested I was being unnecessarily jittery and really really annoying. T’was a good day for a walk, and Lochaberites were out and about in celebration. I take the signage very seriously. But we were only coming back by this track, and were skimming up the hill a bit and through a bealach/coll that led us to skirt around the hill and into the upper reaches of the glen at Old Steall. That is to the left of the photo and through the low point up there. Seemed straight forward enough but it was a sharp start, I’m not fit and once we got to the start of the snow level it was slidey and crossing a slope is often harder than climbing straight up. I was a bit moany and was using my Andrew Stick to keep me upright. Spook had his hands in his pockets most of the time. But I did take time to stop and exclaim at the view which changes so quickly with a little height. I’ve never seen Steall from this angle before. There’s nothing particularly romantic about walking with Spook. He’s naturally very fit and this allows him to keep a safe distance from the complainant. I did recover my equilibrium by the time we got to the bealach as the sun had come out, I’d warmed up my imagination and was thinking of White Walkers or Native Americans doing that old trick when your stuck in the gorge with no way out. However, the bealach was tiny and we were through to the other side quickly with only deep snow to booby trap us. Andrew’s stick was the measure of it. And my guide seemed to know where he was going. This was the point where a bit of an effort for what I’d thought was a stroll, became a magnificent walk. For the most part, we were walking across a bog, but the snow protected us from much of that. This was a plateau above Old Steall so we had a steep track to get down into the Glen. 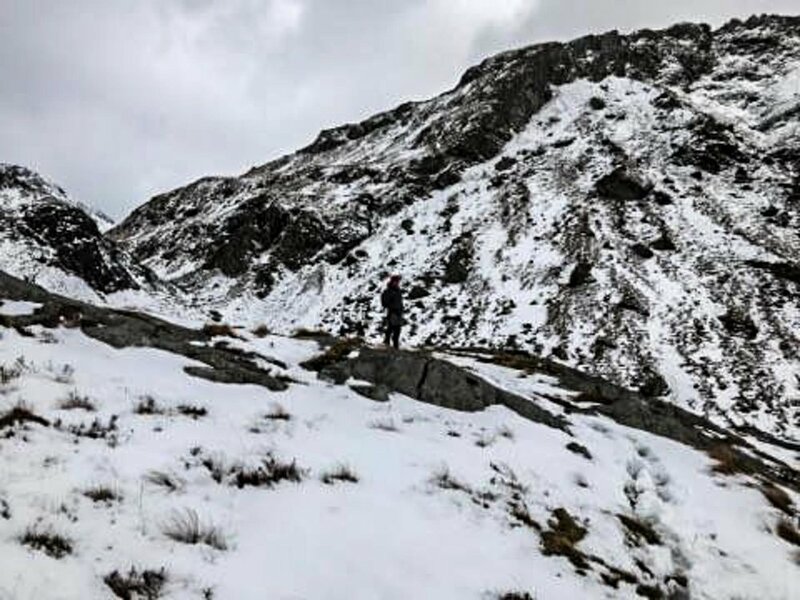 Familiar territory, coming back out of Steall by the traditional route. Last of The Mohicans tree. 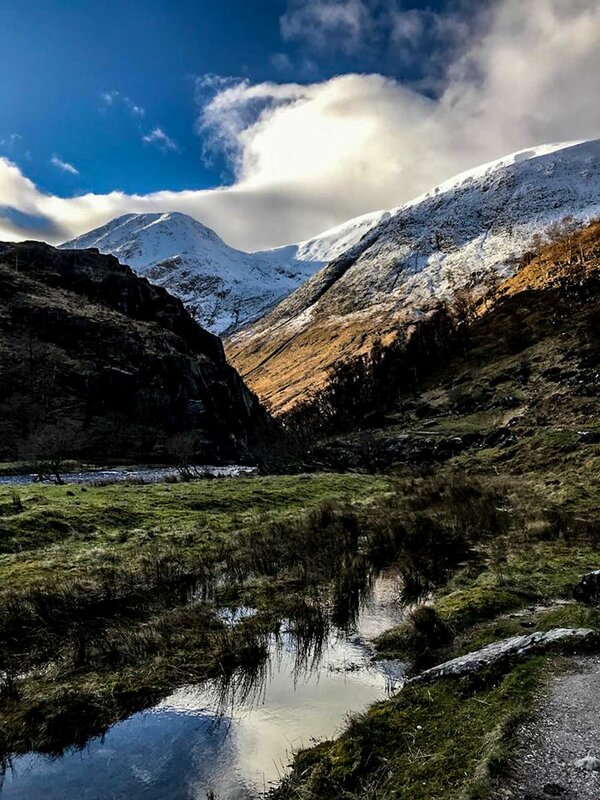 This is a fantastic way to walk around Steall - it’s not a stroll, but is worth every effort. Ideally, you don’t want to go with me. There’s a reason why I do a lot of things by myself.